KINGSTOWN, Nov 12 2013 (IPS) - Weary of sky-high electricity prices, St. Vincent is following in the footsteps of another, decidedly un-tropical island nearly 4,000 miles away in its quest to harness clean geothermal power. A contingent of Icelandic scientists is here until December, investigating the mountainous nation’s geothermal potential, estimated at 890 megawatts. The source is the island’s La Soufrière volcano, which has erupted three times since 1902. There is a steaming resurgent dome in the crater and numerous hot springs in river valleys on the western side of the volcano. Of additional interest are three striking features near Wallibou Beach, in an area locally known as “Hot Waters,” and a circular feature near Morgans Wood near Trinity Falls. “They will go into the Soufrière mountains, doing some surface exploration work. This is like hiking, just scientists walking around with some measuring devices and measuring resistivity of the earth, of the volcano, and by doing that, they will get an indication if there is a possible resource in the area,” Gunnar Orn Gunnarsson, chief operating officer of Reykjavik Geothermal, told IPS. “We are confident that there is but first we have to do measurements to be able to confirm that,” said Gunnarsson, whose own nation relies on geothermal for about a quarter of all electricity generation. Funding for the 50-million-dollar project is coming from the Bill, Hillary & Chelsea Clinton Foundation, the St. Vincent and the Grenadines government, Barbados Light & Power Holdings and Reykjavik Geothermal. Scientists rank St. Vincent fourth on a list of countries in the Lesser Antilles with geothermal energy potential, behind Guadeloupe, St. Lucia and Dominica. Nevis, Saba, St. Kitts, Grenada, Martinique, Montserrat and Statia complete the list of the top 11 countries. Dominica recently launched its own geothermal project with the construction of a small power plant for domestic consumption and a bigger plant of up to 100 megawatts of electricity for export to the neighbouring French Islands of Guadeloupe and Martinique. St. Vincent currently produces just over five megawatts of electricity from its three hydropower stations. The peak demand for electricity is between 20-21 megawatts. With the addition of a geothermal plant, the island is looking to produce an additional 10 megawatts to bring total production to 15 megawatts. “When [former] President [Bill] Clinton first started this idea about reaching out to islands, he knew the price of electricity and specifically told me the electricity cost in almost every island in the Caribbean, so obviously he had put some time into looking at this and was concerned about it,” Jan Hartke, global director of the Clinton Climate Initiative Clean Energy Project, told IPS. 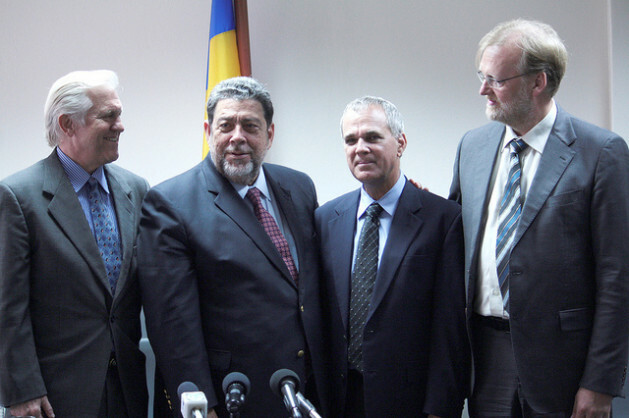 Prime Minister Gonsalves also sees it as a major development opportunity. “As our energy costs come down, you can expect more hotels to come. You can expect factories which don’t want to set up here because of the high cost of electricity, and as you get more tourists there are other knock-on effects,” he said. “More restaurants will be built and opened with a comfortable eating environment for clients, because running an air conditioning unit on an ongoing basis at 40 cents per kilowatt hour, it could eat up all of your profits,” he told IPS. The Caribbean is one of the regions most prone to natural disasters resulting from climate change and officials are hoping that geothermal energy is the answer to their mounting climate change concerns. Hartke said the climate issue and its effect on Caribbean countries was also of particular concern to the Clinton foundation. Officials have already commenced public education exercises for residents of North Windward in the northeast of the island and Chateaubelair in the northwest, the two communities closest to the volcano which occupies most of the northern third of the country. “It is very important to keep the people informed since those areas are going to be directly affected in terms of exploration and production,” Gonsalves said. Local resident Rochelle Baptiste welcomed the government-led initiative to seek cheaper energy through geothermal exploration. Like most Vincentians, she is eagerly awaiting the end result. “In this harsh economic climate it is important that action be taken to lessen the impact on citizens,” she told IPS. “High energy cost is an issue that our citizens have been struggling with over the years which in some respect has been hampering social and economic development as persons are just not able to meet the cost on their monthly electricity bills compounded with other bills. “In North Windward where I grew up and still spend most of my time, I remember how much we yearned for electricity when most of the country was brightly lit. When it came, we were elated but it came with a price which residents are still struggling to pay for. Each month you can hear the cry as neighbours complain to neighbours about the high cost of electricity, as they ponder how they are going to meet the payment,” Baptiste added.